With opportunities for engagement that include ‘Chefugee’ cooking classes and yoga sessions led by a certified teacher, our partnership with Madrid for Refugees has us excited in more ways than one! The guests on our Retreat to Spain trip are surely in for a treat (literally and figuratively - just check out the food pics from previous cooking classes on their Instagram!) Of course, offering unique opportunities for refugees and asylum seekers in Madrid to share their skills, culture and local cuisine with guests is just one of the many incredible programs that MFR spearheads. They act as a beacon of community and support for hundreds in need. We spoke with Madrid for Refugees founder Christina Samson about the integral work they do. What is the mission of Madrid for Refugees? When did Madrid for Refugees begin, and what drove its creation? After meeting an individual who happened to be a refugee and shared her story, our president and co-founder Christina Samson was inspired to respond to the growing refugee crisis and she started Madrid For Refugees in 2015. It first started as Facebook group and then after meeting face-to-face, it developed into a small team of committed volunteers with a mission of helping and empowering refugees in the community. Madrid For Refugees, a non-profit organization, has since grown to have over 100 volunteers from more than 20 countries, lead by a management team (also volunteers!) of 10 people. Our group joined other ongoing projects with the intention of facilitating the process of integration of refugees into society. Through the donation campaigns, we have also contributed to sending supplies to refugee camps abroad. As an international group, we have a unique opportunity to promote employment in the global market and cooperate with international organizations to raise awareness of the current crisis. What has been the greatest achievements of Madrid for Refugees so far? Our flagship initiative is the Madrid For Refugees community co-working and incubator space for refugees. Through this interactive hub, we provide refugees with a space to run their own initiatives and projects, we provide training and education for refugees (language, coding and digital arts courses), we house a storage space for items donated to refugees, and we organize community benefit events and initiatives which support MFR’s other activities including job assistance, mentorship, community integration and volunteer training. Our center is very impactful with almost daily activities run by or for refugees. Through initiatives, we support more than 300 refugees in official refugee centers run by the government and by NGOs, along with more than 60 families in the community. We work with refugees from all over the world, such as Syria, Ukraine, Afghanistan, Iraq, Iran, Jamaica, Venezuela, Eritrea, Morocco, Honduras, Colombia, El Salvador. They are escaping extreme situations where their life is in danger, for reasons such as military conflicts or political persecution. We collaborate officially with 2 Government-run refugee centers, various CEAR centers, and a housing facility for children. We also collaborate with the United Nations (Agencia de Naciones Unidas para los Refugiados), la Comisión Española de Ayuda al Refugiado (CEAR). What are your biggest challenges in running Madrid for Refugees? Managing volunteers and finding financial resources are the biggest challenges. When working with volunteers, some may come and go and takes a lot of effort to ensure that volunteers are motivated and continue adding value to the organization. And as far as finding financial resources, since we are completely volunteer-run, all our volunteers also have full-time jobs and it is difficult to find the time and resources to raise funds to make sure our activities can continue running. A community yoga class offered by a refugee that is a certified yoga & dance instructor. What would you say sets your organization apart from other refugee organizations in Spain? 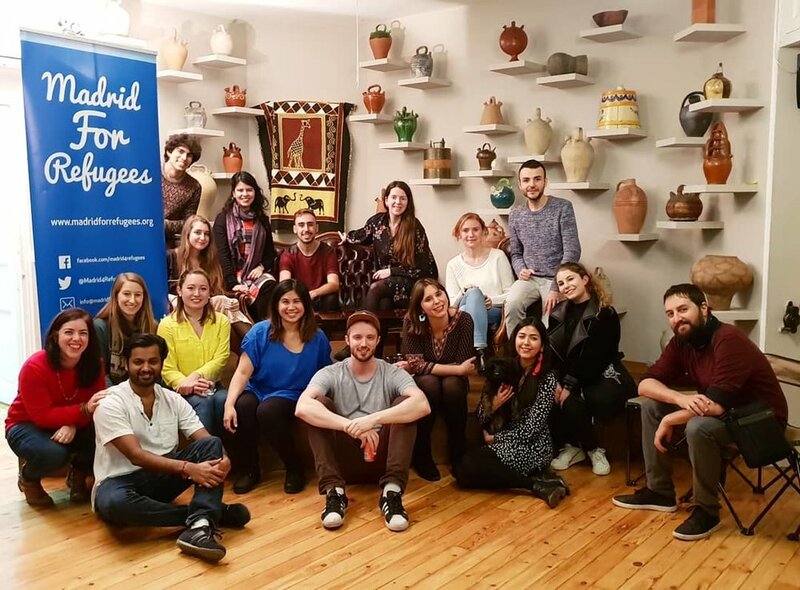 There are numerous other organizations doing amazing work helping refugees and migrants, but Madrid For Refugees can really offer a face-to-face special connection to our refugee network, giving them the personalized support and opportunities that they need. We do not offer legal support or immigration advice, which we leave to other organizations, and we can completely focus on social and community integration. Talk to us about the Madrid for Refugees team. Are they volunteers or is it a full-time job? What types of daily tasks do they do? Madrid For Refugees (MFR) is a non-profit, 100% volunteer-run organization. We have volunteers covering every different program, such as the language, coding and digital arts classes; the cooking classes; fundraising events; community benefit events; job assistance and mentorships; volunteer training; donations; among others. What are you most looking forward to about the collaboration with Traverse Journeys and the time that our guests will spend with Madrid for Refugees on our Retreat to Spain trip? We look forward to showing guests a unique and special cultural and gastronomic experience that is enjoyable and also empowering. We’re certainly looking forward to it as well!